Earlier today the International Bluegrass Music Association unveiled more performers for the 2015 Wide Open Bluegrass festivities returning to downtown Raleigh this fall, including the two headliners for the big shows at Red Hat Amphitheater. 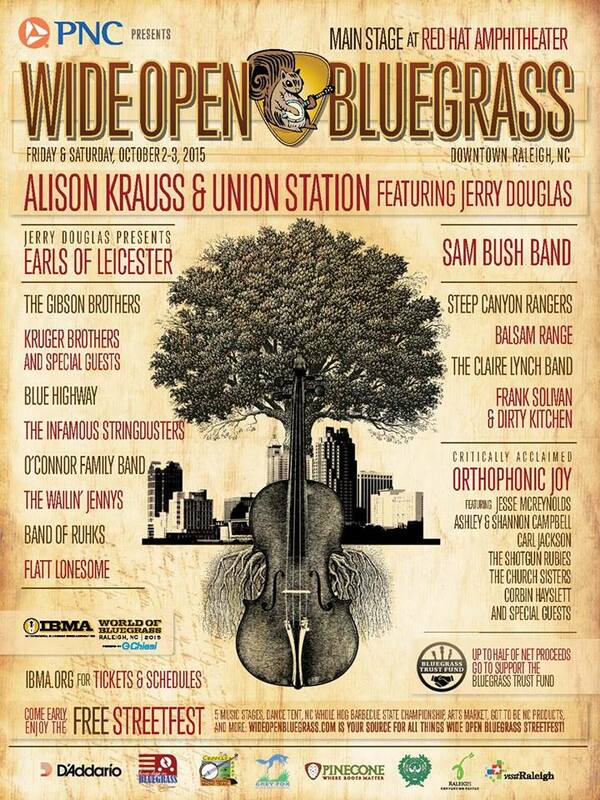 Alison Krauss and Union Station will headline the amphitheater on Friday, October 2, with Steep Canyon Rangers, Balsam Range, The Gibson Brothers, Claire Lynch Band, Frank Solivan & Dirty Kitchen Orthophonic Joy and Blue Highway rounding out the lineup. The Sam Bush Band and Jerry Douglas presents Earls of Leicester will headline on Saturday, October 3, with Infamous Stringdusters, The Wailin' Jennys, Kruger Brothers with special guests, Band of Ruhks, O’Connor Family Band and Flatt Lonesomewill rounding out the lineup that day. Tickets for the big event are on sale now HERE. Two-day tickets for folks who are not IMBA members are $100 (lawn) or $120/$140 (reserved seating). Single day tickets are $50 (lawn) or $60/$70 (reserved seating). The free street festival will feature more than 80 performers. There will be information about the lineup in the coming months. The Bluegrass Ramble, the nighttime performances at clubs all over downtown Raleigh, will be back from September 29 to October 1. Checkout the lineup below. 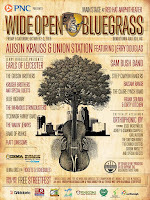 Tickets are on sale now HERE for $30 for a single night or $75 for all three nights (those are non-IBMA member prices).